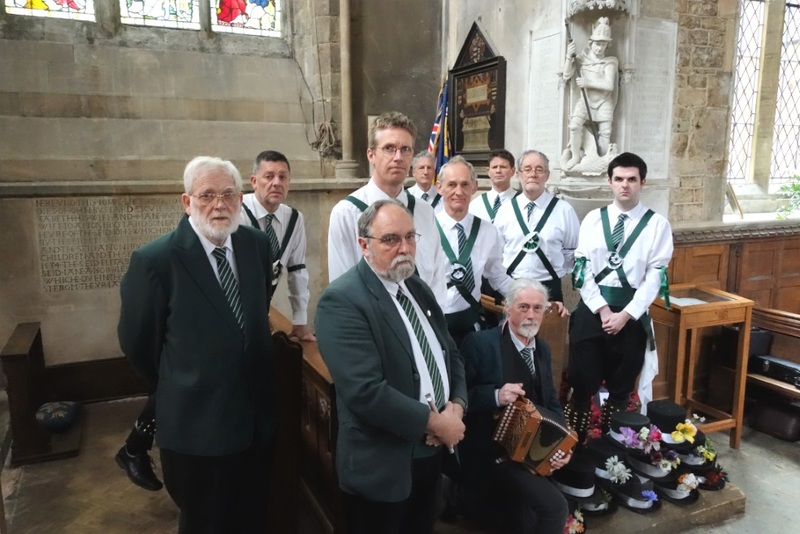 Nine dancers and three musicians from the current side took part in a short ceremony to remember Pte Ronald Leonard Pargeter of the 2nd Battalion, Princess Charlotte of Wales’s (Royal Berks Regiment) 25 Brigade, the last of the pre-World War One side to be killed in action. He died on the Somme on this day 100 years ago. Mike Dalchau, a member of the current side planted a wooden cross in the garden of remembrance of St Mary’s Adderbury. We then filed into the church where Chris Holmes read ‘Anthem For Doomed Youth’ by Wilfred Owen. Squire John Ekers read some words by Marianne Griffin and a wreath was laid by Ryan Jamniuk. After a pause for remembrance, Chris Garrett, Treasurer of the current side recited ‘Adderbury Sunrise’ by Richard Thompson. Those present then joined in the singing of ‘The Happy Man’ and a song composed by musician Donald McCombie, ‘They’ll Never Dance Again’. The ceremony concluded with a harmonica solo of the tune Shepherd’s Hey followed by the dance of that name in the aisle.